Yesterday was a great day as far as deadlifting goes. 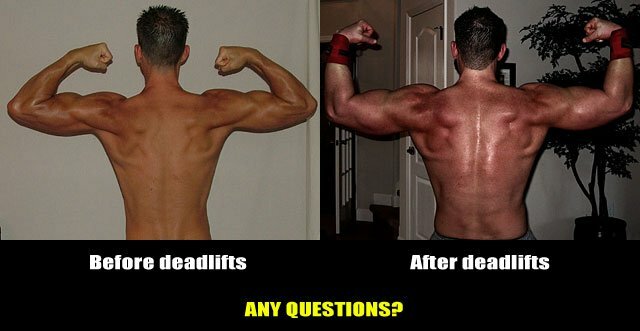 No, that is not my back in the image above, but it is a great illustration of the power of deadlifting from John Stone of https://johnstonefitness.com. So, it might be as inspiring to you as it is to me to keep deadlifting. There is no question that deadlifting is hard work, but it is clear that the results can be powerful. I hit my new high for 12 repetitions with 135lbs, using 45lb plates and the 45lb olympic bar. First, it is very important to get in your rest. For a few weeks, I was not listening to that advice and lifting every day one set for twelve reps. But recently I cut back and started deadlifting only every other day with weekends off totally. I could feel the results yesterday. I have increased deadlifting weight from 45lbs to 135lbs. Of course the initial improvements were faster and now the deadlift weight increases are going slower. But that is okay, gradual is good. If you have not yet started a deadlifting program, please consider it. But once you get started, make sure to get in at least a full rest day in between deadlifts and a full weekend off. Second, I believe that you will feel stronger and get stronger the more that you clean up your diet. Clean up your diet means to eliminate as much junk and processed foods as possible. Bananas – especially good after a workout. I like mine with Peanut or Almond Butter.